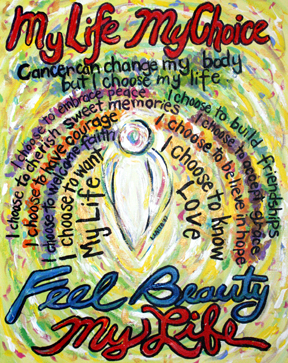 DonnaBellas Angels~ Medicine Heals the Body, Art Heals the Soul! 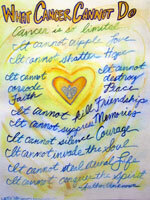 "I like to hang the pictures in my room when I come to the hospital for chemo. It gives me something pretty to look at when I am not feeling good." We are a non-profit organization dedicated to providing inspirational art with healing images to medical clinics, patients, and caregivers. We donate art to clinics. It is supported through donations and sales from our art shop. Our aim is to help provide emotional healing to those who are receiving treatment for chronic or terminal illnesses as well as their caregivers and loved ones. Click on about us to learn how we started, meet our board, and see our plans. 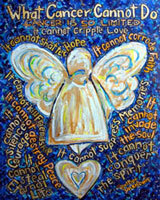 DonnaBellas Angels creates original paintings and posters with healing themes for donation to medical clinics. We give art to individuals thorough donating art prints that nurses, patient advocates, and hospital chaplains can distribute directly to patients and caregivers. We also allow contracted ro yalty use of our images for projects. Projects have included shirts, quilts, and medical clinic wellness tip cards. 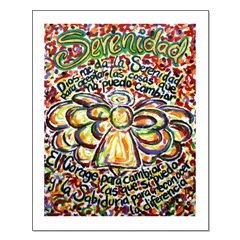 Art images feature angels, hearts, butterflies, inspirational words, and more. The art is designed to be colorful and bright for an emotional uplift. Like all art, the viewer can see what they want in the image. The angel can be a literal angel or a metaphor for a human spirit with wings. 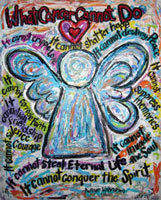 It can be art to provide hope in life or art to provide memory for someone passed away. Your interpretation is a personal choice and journey. 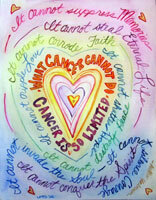 We use fundraising to provide free art to medical clinics, patients, and caregivers. Click on Donate to find out how to make a contribution to our organization. We use sales from our online stores to support our non-profit. To see a selection of all the items available, please visit our CafePress or Zazzle stores. We earn art royalty credit (5% - 25%) on each sale. For shopping at Zazzle, we earn an additional "referral" credit of 15% if you do your shopping using one of the Zazzle links (like this one) on this website. The referral credit includes purchases not only from our store but items from other stores on Zazzle. Learn about the different ways you can help support DonnaBellas Angels from spreading the word about us to using online retailers who will donate proceeds of each sale to our organization! Learn more here. 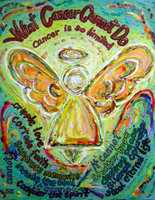 DonnaBellas Angels also provides its art free via contracted royalty art use to groups who want to fundraise for medical research, e.g., Relay-For-Life team banner and t-shirts. We suggest a 10% donation back to our non-profit in order that we can continue our mission of providing art to patients in need and their loved ones. Learn more at Events. If you wish to contact us, we welcome email at info@donnabellasangels.org. Please click on Contact for our mailing address.